This is the place where all your Workspaces and boards are created and located. It also provides access to settings and other useful functionalities in the system. 1. The Workspace (1) is represented by the blue ribbon on the left side of the window. All of your Boards live in Workspaces. Think of a Workspace as the environment that collects Boards of different departments in your organization. To create a new Workspace-> click on the Retractable menu (4) -> select "Add Workspace". Use the Workspace settings icon to Rename/Cope or Archive a Workspace. From there, you can also create and manage other properties such as card types, templates and custom fields for the cards. 2. The Kanban board (2) is the tool for mapping and visualizing each step of your process in the flow. To create a board use the "Add Board" icon to the right of the Workspace ribbon. There is no limit on the number of boards you can create under a Workspace. Each board has its own settings, which to some extent overlap with the workspace settings. The small icons on the board ribbon indicate for overdue or blocked cards in your workflow. 3. Widget (3) - the "Initiatives in Progress" table to the right side of the Dashboard is an example of a widget. You can use widgets to see summarized information from your account at a glance. - View Reports - generate Timesheet reports to track the logged time spent on each task. - Manage Workspace Templates - save your Workspaces including Boards as Workspace templates. If you have an Account Owner privileges, you will see all Workspaces and Boards in the account. You can fold your Workspaces for better visibility by clicking on the minus sign to the left of the Workspace name. Click on the plus sign to expand it back. To organize your Workspaces in a preferred order, click on the blue ribbon and drag and drop the Workspace to the desired position. 3. How does the Workspace & Board filter work? 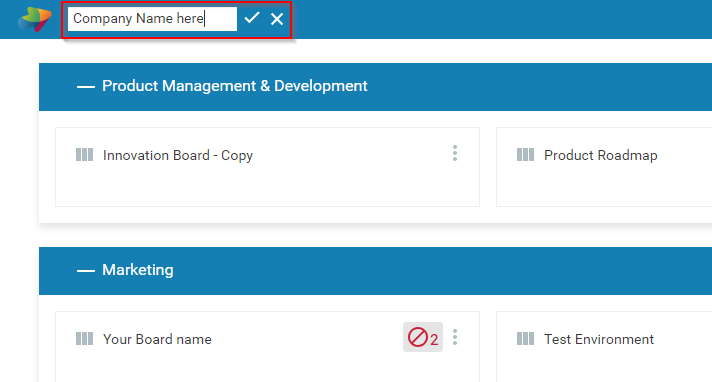 The Filter located at the bottom left corner of your screen allows you to filter your dashboard and run a quick search on your Workspaces and boards. Type the Workspace/Board name or use a keyword from the title to instantly filter. Note: The filter will be saved even if you refresh your browser or start a new session after having logged out from your account. To remove the filter, just delete the text from the filter field. If you want to filter based on а second criteria, separate it with space or a comma. 5. How to add your company name to the Dashboard? Display your Company name at the top left corner of the Dashboard. Hover over and use the edit icon to insert the name of your organization and click on the checkmark icon to save it. Clicking on the Kanbanize logo will open our homepage in a new browser tab. Use the buttons at the top right corner of your Dashboard to access useful system features and account settings. 1. Advanced Search - use the search option to quickly search for a card by typing a keyword or a card ID -> press the Enter key and the system will display the matching results in a Table view format. Use the magnifying glass to filter and configure the data in your account and group together information to generate a different type of reports. 2. The Administration control panel is the area where Account owners and Workspace managers have a control over new and existing users, their roles and privileges. 3. Help Center - check our Help center to learn how to make the most of Kanbanize. You can filter out your results to open a video, knowledge base article or a tutorial. 4. Notifications - sign up for in-app or email notifications to keep track of your team's activities and/or your own actions. You have the option to subscribe only for notifications, you are interested in. Important: Notification settings are configured per board! 5. My Account lets you easily manage your account details, time zone, change password, etc.